A few instalments ago, we introduced the concept of storing network credentials as a way of improving the usability of a Media Center add-on; since the primary means of input is a remote control, we want to minimise text entry wherever possible. However, with storing credentials, we’re bound by responsibility to do so in a secure fashion. After all, this is sensitive information. Enter, the Microsoft Cryptographic API. This API not only provides cryptographic algorithms (RSA, DES, etc) but also provides interoperability with the Windows key store. By using the CryptoAPI, the onice is no longer on your code to store and retrieve encryption keys; it’s all handled transparently and securely. 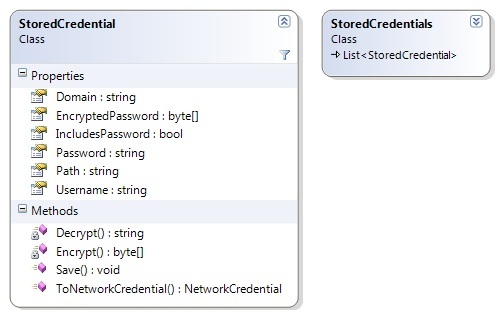 The StoredCredential class holds all properties needed to access a network resource (domain, username and password), as well as a context (path). A determination is also made as to whether the password will be persisted; if not, the password will be held in memory for the life of the process only. The process of finding the correct credentials for any given path simply involves finding the instance with the deepest partially (or completely) matching path. This type is designed to be stored in an ordinary XML application settings file. At run-time, the password can be decrypted. When serialised to XML, only the encrypted password is saved. As you can see, all we have to do is transform the data into a byte array (using ASCII encoding in this case – this is appropriate for English language systems). The XmlIgnore attribute ensures that the clear-text password is never serialised. If we’re not persisting the password, we can just get and set the temporary password variable; otherwise, we get the password by decrypting and set the password by encrypting using the aforementioned methods. The StorePasswords application setting simply determines whether passwords are being persisted. Posted in Announcements, Windows Media Center.Tagged C#, encryption, media center, XML. Did you ever post the complete project code and binaries? I would love to see more details. I found mcnetworkcopy after my comment. I see the Z sample in the SDK use WCF server outside of Media Center and your plugin use WCF server in Media Center. Which way is better or does it not matter? The advantage of running the WCF server inside Media Center is that it can access the API, and that the server auto-starts along with Media Center. In my opinion, this is the best approach. I’m trying to build a plugin that must target x86 platform to work. It works fine on Windows 7 32bit but on Windows 7 64bit I get the following error. InnerException System.IO.FileNotFoundException: Could not load file or assembly ‘Test, Version=1.0.0.0, Culture=neutral, PublicKeyToken=b5858f5e428c5a86’ or one of its dependencies. The system cannot find the file specified. I am using the WIX setup template added to the project by Media Center SDK to install the plugin. Do you know how I can register a x86 dll to work with Media Center on Windows 7 64bit? Building the plugin with the AnyCPU option allows the plugin to load but it does not work correctly. Also I created a test console app and build as x86 and when I click the exe file it works on Windows 7 64bit.